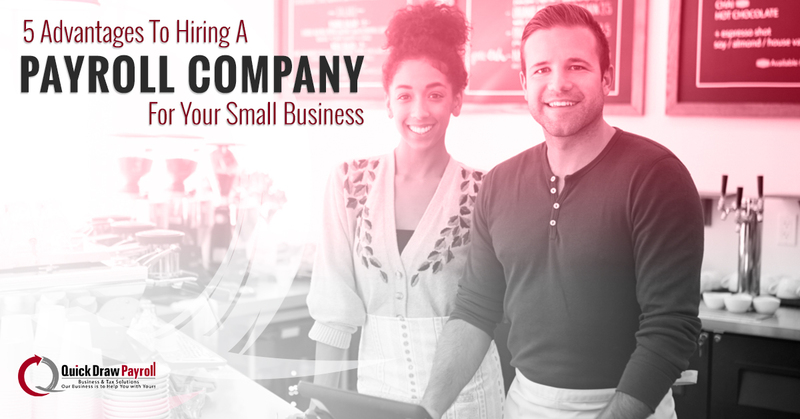 Do you run a small business? Have you been put in charge of HR and need to find a payroll service for your employer’s company? At Quick Draw Payroll, we understand how tight the budget can be when running a small business. Our professionals are certified and trained to make the most out of every dollar when you decide to work with us. In this post, we’ll be discussing the five advantages of hiring a payroll service for your small business. If you’re ready to start service with us, give us a call today! How much time do you spend every pay period writing checks, filing paperwork, and making sure the numbers check out with your books? How much money would you make if you were working on your business during that time instead of dealing with minutiae? Time is your most valuable asset. Running a small business demands you know how to manage your time to make the most out of every single day. We believe our small business payroll services offers your company a chance to be more productive and make more money when you partner with us. You’ll spend less time worrying about paying your employees and more time building your business. It’s common for small business owners to think that paying for a payroll service is an expense. For companies with 20 employees or less, outsourcing payroll actually saves money. How is this possible? The answer is two-fold. The first fold is that you can spend more time growing your business instead of spending time on HR-like tasks. The second layer keeps you from making small mistakes on payroll that cost you hundreds–sometimes thousands–later down the road around tax season. It’s estimated that nearly 40 percent of small businesses pay a penalty to the IRS every year in relation to improperly filing taxes surrounding payroll. How much money are you losing because you can’t “afford” hiring a payroll service for your small business? At Quick Draw Payroll in Medina, our professionals are certified and dedicated to the success of your business. We’re tax liability experts looking to reduce your tax responsibility as much as possible. You earned your income. You should keep as much of it as possible. At Quick Draw Payroll, we want you to keep as much of your revenue as possible. Small businesses are the heartbeat of America, especially in Texas. When it comes to tax and legal compliance in relation to payroll we take care of it all for you. We meet filing deadlines and deposit responsibilities without any hiccups. If you have an internal team taking care of your payroll, we encourage you to consider a small business payroll service. At Quick Draw Payroll, we understand tax liabilities, payroll process, legal compliance, and much more. We ensure that your employees get paid on time and the correct amount. Our years of experience and certifications make it worth every penny to hire us. We’ll save you from penalties and work to put more of your hard earned money back into your pocket. Call Quick Draw Payroll Today! Are you looking to hire a payroll service for your small business? At Quick Draw Payroll, we offer a variety of services, plans, and strategies to ensure your business is keeps growing. If you’re ready to partner with us, call today! We’ve been serving Medina and Bandera for years!